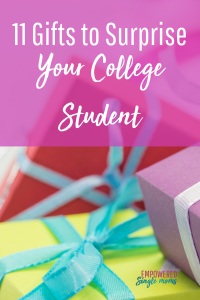 I am looking for a college student gift that is just right. This post contains affiliate links, which means that if you buy a suggested product I will earn a small commission. Read the full disclosure policy here. Most college dorm beds are larger than a regular twin bed. Check the size of the bed before your order sheets. this depends on your child’s major, so find out the requirents are depending on what types of programs your child will need to be running. Here is a laptop guide to help you out. 7. Shop Amazon Gift Cards. Any Occasion. No Expiration. These are the perfect gift to buy books, household supplies or even groceries. If your child’s college is in a city, groceries can be delivered the same day. Many colleges do discourage cars the first year or two, so having a few groceries delievered can be very helpful for snacks or to supplement the food plan on campus. When your college student moves into their first house or apartment a tool box will come in handy. A care package is perfect for a few weeks into the semester and again during finals week. Put together a book or recipe box with some of your student’s favorite foods. I didn’t need a recipe for tator tot hotdish. One of my son’s favorite meals, but he did. Send it with the ingredients for one of his favorite meals when he moves into his first place where he has a kitchen. Pin this post for later here.